Perhaps why I was overwhelmed by my visit to this site, was not only because Gallipoli figures so prominently as part of the Australian national identity but because of how this event has tied together multiple national histories – most significantly the ANZACs (Australia and New Zealand) and Turkey. What evolved from this bloody World War One conflict is a firm friendship between nations joined together in mourning and loss. What I also found very interesting was how the ANZACs and Turks would share with each other – throwing canned food and bags of tobacco to each other in the trenches. This inscription also appears on the Kemal Atatürk Memorial, ANZAC Parade, Canberra. For me, what was most touching about the visit to Anzac Cove and Lone Pine was the respectful way our tour guide, Ganul discussed the events. As we left Lone Pine, Ganul put Eric Bogel’s ‘And the Band played Waltzing Matilda’, asking people to ‘please don’t cry’. I am sorry Ganul, but I am certain there were many tears quietly shed as we drove through the beautiful hills surrounding this memorial site. Wish I had known you were going there! My grandmother’s brother is buried there. Dad and I had a little weep as we read of your experience at Gallipoli. My Gandma W brother died in England of wounds received WW1 – not sure where he was wounded. Also my Gandad W brothers served in WW1. My Grandad H served in France in WW1 – he was in the Artilery (horse drawn artilery) he was wounded. So we have connections to WW1. I think Dad and I will have to consider a journey to Gallipoli some time. The experience sounds so reverent and memorable. Maybe not on ANZAC day though. For Australians who died in theatres of war overseas and consequently burried in foreign lands, their graves are maintained by the Australian Government through the Australian War Grave Commission. My cousin Ian’s father is buried in Bouganville. Sadly he was killed in action 6 weeks before the 2WW ended. I trust you’re continuing to enjoy your Turkey sojourn. 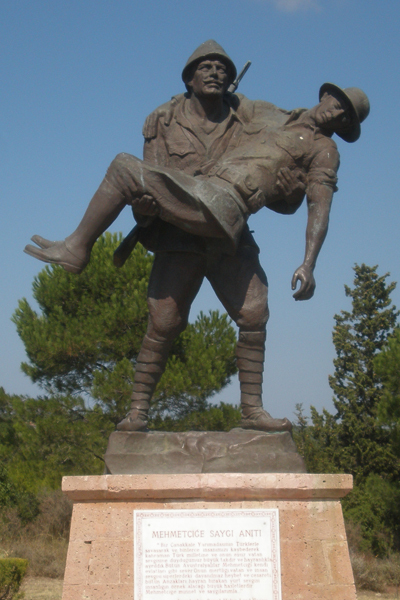 Today is ANZAC day so I thought that I would repost an article from our 2001 trip to Gallipoli.